I’ve been an instructor for about six and a half years now. As enjoyable and rewarding as it is to teach, I’ve sometimes missed being on the other side of the table. Learning something new, taking on a fresh challenge, delving into an as-yet unexplored side of the aviation world is a good thing; it not only expands my own horizons, but it helps me better stay in touch with what my own students face as they pursue various ratings, certificates, and checkouts. So it is with a great deal of excitement that I find myself in Dallas, Texas for a type rating on the Gulfstream IV. A “type rating” is a specialized and intensive course designed around a very specific type of airplane. Generally, aircraft which weigh more than 12,500 lbs and/or are turbojet powered will require a type rating. 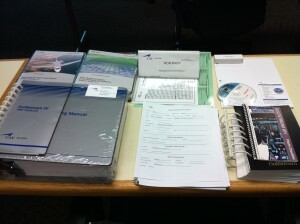 The one I’m getting will qualify me (on paper) to act as Pilot-in-Command of a Gulfstream 300, 400, IV, and/or IV-SP. I say “on paper” because there’s a lot more to it than just the formal training. There’s RVSM, international flying, ETOPS, and a dozen other things to learn about. Plus, even when I graduate I’ll be brand new to the airplane. But everyone has to start somewhere, and this is an excellent place to begin. I’ll also be upgrading my commercial pilot certificate to an Airline Transport Pilot certificate. I could have done that many years ago, but there really wasn’t any point since I didn’t have a need for it. Anything which was likely to require an ATP certificate was also likely to require a type rating, and since you can get them both at the same time without any additional effort or cost, why to do it before it’s needed? The only pre-requisite is the ATP knowledge test, and I spent a couple of weeks last month studying for and passing that hurdle. Anyway, on to the training. Day one was largely administrative. Checking in at CAE Simuflite’s facility near DFW Airport, getting books, meeting the instructor, filling out paperwork, taking a tour of the facilities, etc. Speaking of facilities, Simuflite has a nice one here. The three floors contain a library, pilot lounge (with a hang gliding sim and putting green — can’t let your golf game atrophy while you train, you know! ), cafeteria, offices, classrooms, and of course, the simulator bays. At this facility, they train pilots on 52 different aircraft types ranging from the G-II, III, IV, and V, to the spectrum of Learjets, Falcons, and Citations. One bit of training I did not expect to receive was on what to do if a tornado sprouted up nearby. Basically, stay away from the glass-roofed atrium and head for a reinforced concrete hallway on the first floor. We don’t get many tornadoes in southern California, but our instructor said there had been one in the area just last week. My class size is on the small side. Well, actually, I don’t know what constitutes a “normal” class size, but the instructor did say that business is down a bit. No surprise since the entire aviation sector has been hurting for several years. Anyway, there are six pilots in my class. Two of them fly for Level 3 Communications and are transitioning from the Falcon 50 to the G-IV. They’re extremely nice guys, probably late 40’s, laid back, and have a great sense of humor. I imagine they’d be great to fly with on a multi-day trip. The other two are polar opposites. One is a charter pilot, a former G-IV flier who moved to a Gulfstream V for a while, and is now going back to the IV. I queried him about why he was in an “initial” training course. I would think a 5 day “recurrent” class would be more than sufficient with his experience, but he said that it had been over 36 months since he’d flown the G-IV, and therefore he was required to go through the full 21-day course. Even he was surprised by it. But what can you do? Rules are rules, I suppose. The last guy is a Twin Otter pilot for NOAA, the National Oceanic and Atmospheric Administration (I love that name, by the way; how can you “administer” either the ocean or the atmosphere??). He’s an ex-Marine who started flying after he got out of the service, and after flying the Twin Otter for a few years bid for and received a slot on the G-IV. Apparently NOAA flies the Gulfstream into full-blown hurricanes to take measurements and drop various sensors. Sounds like an exciting gig, eh? They also fly the P-3 Orion, and that was his original goal. But unfortunately the only other operators of the P-3 are the military, so to even fly it for NOAA, you have to spend three years training with an active duty military squadron. You just can’t get training on that aircraft from FlightSafety or Simuflite. It’s a good group of guys — lots of experience in a wide variety of airplanes, and great personalities. The first several hours of the day were spent on orientation and paperwork. And boy is there a lot of paperwork. The books alone filled up the ample desk space in front of and around me. Here’s a picture of my desk at the start of the day. Simuflite also provides all the books in electronic format on a USB stick. I’ve heard that the Gulfstream V course at FlightSafety is now doing away with the printed books altogether and providing pilots with a pre-loaded iPad. 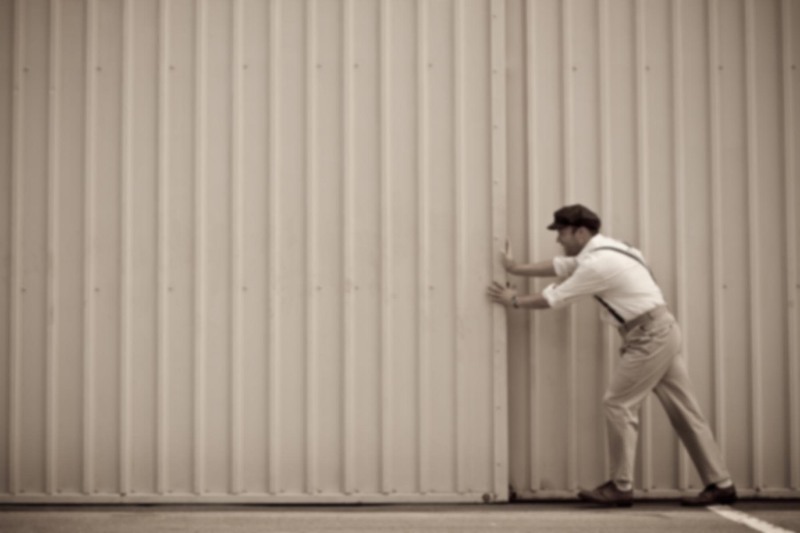 The wave of the future… but until then, we are left with a couple thousand pages of “stuff”. I shouldn’t complain. With the complexity of the G-IV, I’m delighted to have access to so much data. There are countless full-color diagrams showing system details and whatnot. The classroom itself is well-appointed. 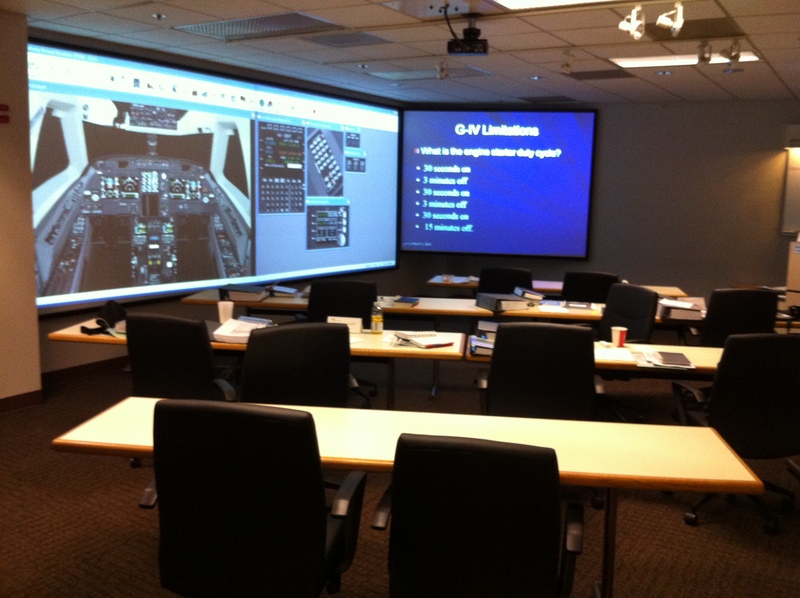 Chairs are comfortable, the room is well lighted, there’s plenty of desk space for us to spread out, and the walls are transformed in to massive display spaces for videos, projections, and a computer-based avionics simulator which, as far as I can tell, Simuflite developed as a proprietary product for their training. One of the three ceiling-mounted projectors malfunctioned several times during the day, but the on-site tech support was there to sort it out within minutes. 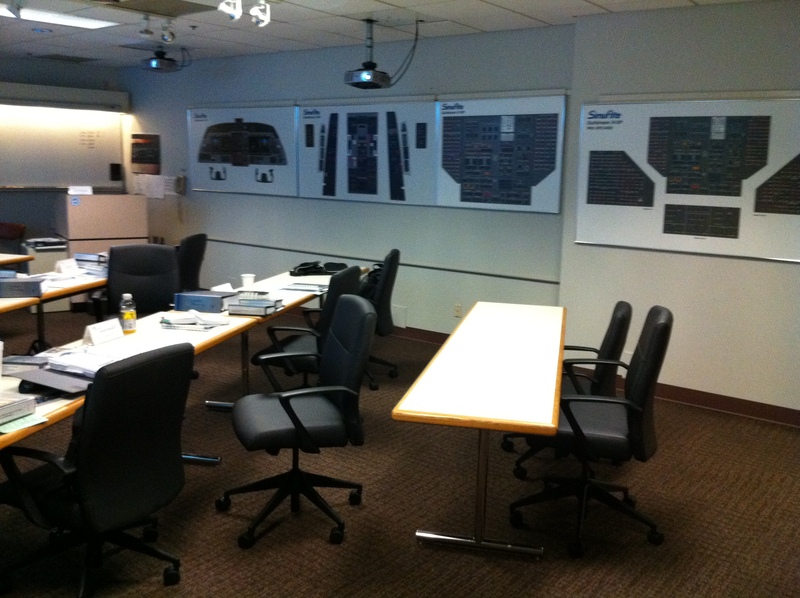 On the right side wall of the classroom are what they call “paper trainers” — cardboard mockups of various circuit breaker panels, avionics displays, and so on. One of the big challenges with all this is just figuring out which equipment to train for. The Gulfstream IV line evolved over the years, so different serial numbers have slightly different options, avionics packages, and — most importantly — limitations. So you have to go through a long decision tree to decode it all. Is your airplane serial number 1000 through 1213? Then your max ramp weight is 73,600 lbs. Unless you have ASC (aircraft service change) 190 installed. Because then it would be 75,000 lbs. But your limit might be 75,000 lbs even if you don’t have ASC 190, if your serial number is 1214 or higher. The basic schedule is for about a week and half of dedicated all-day ground training, followed by simulator sessions for the rest of the course. I’m interested to get into this thing, because it’s a Level D simulator which is supposed to be realistic enough that you can’t tell you’re not in a real airplane. The biggest surprise of the day for me was learning that I have enough turboprop PIC experience and total time that I won’t be subject to what they call an “SOE limitation”. SOE is a supervised operating experience which would prohibit me from exercising the PIC privileges of the type rating until I had amassed 25 hours of flight time on the actual airplane under the supervision of another pilot. It’s purely academic, of course, but I’m surprised that with no pre-existing type ratings, I could go through this course and come away with an unrestricted PIC type rating on the airplane. ← Will This Thing Roll? Good luck! Very envious as well. . . .